Railway Minister Dinesh Trivedi today announced an increase of 2 paise per km to 30 paise/km in passenger rail fares across various categories, choosing to tread a path his predecessors, including his own party chief Mamata Banerjee, had avoided for a decade. 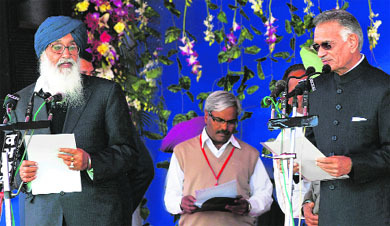 Parkash Singh Badal was today sworn in as the Chief Minister of Punjab for a record fifth time. His son and Shiromani Akali Dal president Sukhbir Singh Badal took oath as the Deputy Chief Minister. Sixteen other legislators took the oath of office and secrecy and allegiance to the Constitution as Cabinet ministers to run the Punjab Government for the next five years. 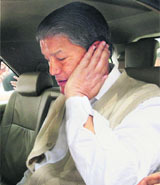 The �revolted� Union Minister of State for Agriculture & Food Processing, Harish Rawat, was again conspicuous by his absence in Parliament today, although the �revolt� by him and his supporters appeared to have simmered down. The government today ruled out the possibility of bailing out the beleaguered Kingfisher Airlines, saying it was for the private promoter to marshal funds to bring the carrier out of the financial crisis. The Opposition today extracted an assurance from the government that the Lokpal Bill aimed at tackling corruption will be taken up for debate in the Rajya Sabha in the first half of the ongoing Budget session of Parliament. The Trinamool Congress may not be in a position to embarrass the government in the Lok Sabha with reports today saying its amendment to the Presidential address had been rejected on technical grounds.